InspIRCd is a modern and fast IRC server and one of the few IRC server applications that provides high performance and stability and is written from scratch in C++. 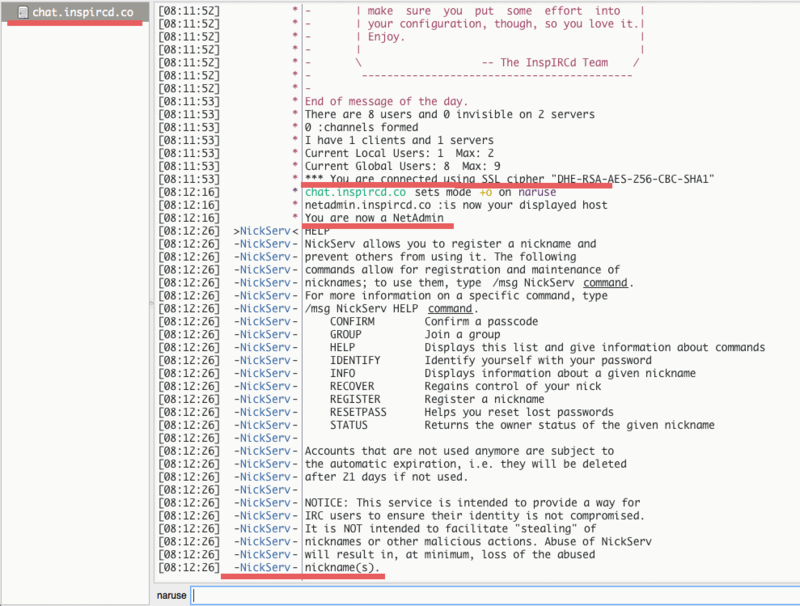 It's one of the best solutions to build your own IRC on your server. It supports two encryption libraries, OpenSSL and gnutls and has support for many services like anope theme. InspIRCd is based on the modular IRCd which provides many modules. If you want to enable a module on InspIRCd, you just need to edit the modules.conf file and add a new line for the module. In this tutorial, I will guide you trough the installation of InspIRCd from source on a CentOS 7 server. Then we will integrate InspIRCd with anope services and enable gnutls encryption on it. Install the Perl extensions so we can use module manager later. -m = create a home folder for the user. -s = define the shell - we use the /bin/bash shell. 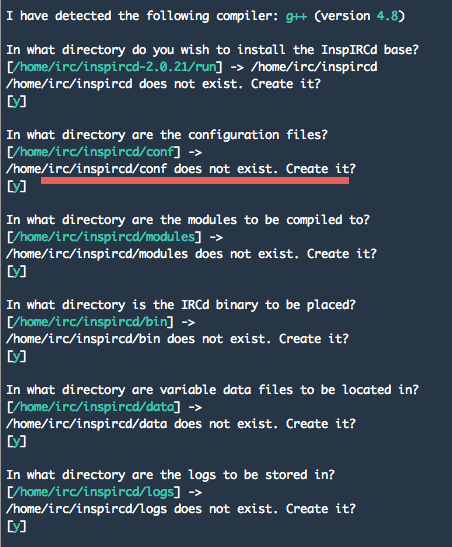 You will be asked for the installation directory, we will use "/home/irc/inspircd/" as the installation directory. Type the complete path of the directory and press y or enter. If all installation is done, go to the inspircd directory. Create a new "cert" directory for the certificate files and create new certificates with the certtool command - or you can use openssl to generate it. Edit the bind address for port and the ssl configuration. edit die and restart configuration. This configuration is used to set the password to restart or shutdown for trusted ircops. Now create new file opers.conf for the operator configuration. commands="DIE RESTART REHASH LOADMODULE UNLOADMODULE RELOADMODULE GLOADMODULE GUNLOADMODULE GRELOADMODULE"
classes="SACommands OperChat BanControl HostCloak Shutdown ServerLink"
host="[email protected] *@localhost *@example.com *@*"
host: define your host, if you want to all host or IP can gain the oper access, define as "*@*". type: type of the operator - NetAdmin, Helper, GlobalOp. Next, copy the samples of motd and rules file from the examples directory. Then create the inspircd configuration, you have to create a new file links.conf for the services configuration. We will use anope services. Then copy the modules configuration from examples directory. And finally, go back to the inspircd directory, and then start the inspircd. You can see port 6697 and 7000 opened. Inspircd has been successfully installed. From the irc user, switch to root by typing 'exit' or press ctrl + d, then install cmake. It's needed for anope installation. Extract anope and compile it. You will be asked about the directory installation, just press enter. This will take some time, don't interrupt the process. When the anope installation is done, got the home directory, remove anope and go to the services directory. The services configuration is available in the conf directory, so go to that directory and copy example.conf to services.conf. line 92 and 93, define your IRC services, it's must match with the inspircd.configuration. line 195, configure the link to the IRC server. If you see the results like on this pic, you have successfully configured the anope services for the inspircd. To ensure that everything works as expected, we should now test the IRC server that we've created. We run IRC on IP 192.168.1.102 and IRC SSL port on 6697. Open an IRC client like xchat, hexchat or irssi and connect to the server. In this tutorial, we will use hexchat. Make user as netadmin or operator. InspIRCd and Anope are installed and configured successfully. 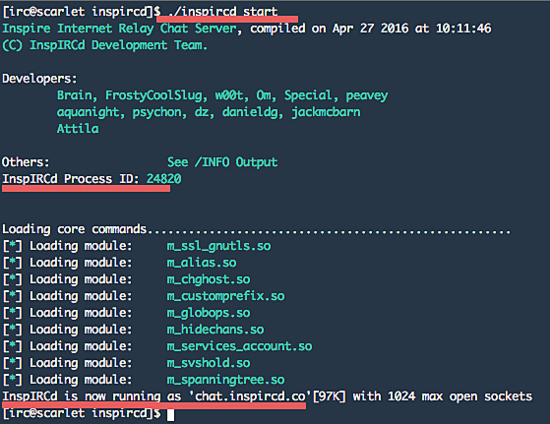 InspIRCd is one of the best IRC servers written in C++. It provides high performance and stability, is customizable and there are many ready made modules available. 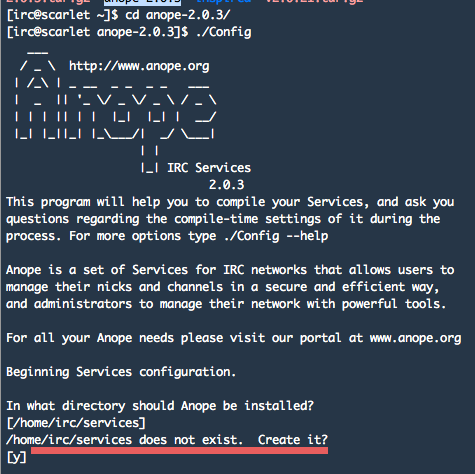 Anope provides flexible IRC services and is easy to use and configure. I'm getting Error while loading os_oline: Your IRCd does not support OMODE. when trying to start anope? I followed everything above but when i start anope i get this? [Aug 30 15:05:24 2016] Error while loading os_oline: Your IRCd does not support OMODE. [Aug 30 15:05:24 2016] DB_FLATFILE: Unable to open data/anope.db for reading! Your inspircd.conf doesn't include the other conf files, which is why commenter 'Long' is getting uplink error. modules.conf isn't being included and thus m_spanningtree.so isn't loaded and thus services won't connect. The inspircd.conf IS NOT including the necessary files in order for Anope services to work, hence, other comments here with the same error or similar. I wasted un-needed time trying to figure out the error and they were just the includes. This will get rid of most of the error. I hope this error in the tutorial gets fixed. Several people have followed this and fell into mistake because of those two missing lines.